Busing then and charter schools now - are they really that different? Detroit Achievement Academy founder Kyle Smitley and teacher Danielle Johnson on the Ellen Degeneres show. There are almost as many charter schools in Detroit as schools run by the Detroit Public Schools. There are 86 DPS schools and 85 charters, a difference of one. There are also more seats in all these schools than kids to fill them. But that didn’t stop 28-year-old Kyle Smitley from opening up her school this year. Smitley opened the Detroit Achievement Academy in one wing of an old church on the city's northwest side. At the school one day this fall, about 30 kindergarten and first graders were sitting very quietly and cross-legged on the rug in front of the principal. The school culture is being built here as kids sing songs about reading and going to college. They are all slowly learning the school-specific lingo about behavior and achievement (words like "appreciation" and "habits of character"). Smitley has high expectations for the school. "Being the best school in Detroit isn’t good enough for us," she says. "We have to be the best in the state." Smitley is up against some stark odds. A majority of the kids in the school are growing up in poverty, and many of them entered school far behind grade level. Smitley also acknowledges that financing the schools is challenging with its small student body. But Smitley is a savvy fundraiser. She's already gotten her school on the Ellen Degeneres show and is cultivating private donors. Smitley's past experience helps her with the salesmanship necessary to start a fledgling school. Before founding the Detroit Achievement Academy, Smitley started and ran an organic children's clothing line. She's unapologetic about not having any previous experience in education. "We have no track record," she says. "I’ve been laughed out of so many rooms coming into the education world." But Smitley was able to hire experienced teachers and get her school qualified as part of the network of Expeditionary Learning schools. Even so, the fact that a former fashion executive has the reins of a charter school serving some of the most educationally vulnerable kids in the country would seem absurd in any place other than Detroit. But even after education reforms that lifted the charter school cap, a state takeover of some schools, and schools of choice, many Detroit parents still can't find a good public school option for their children. Amber Arellano, Executive Director of Education Trust Midwest, says it is because charter school policy focuses more on opening new schools than it does on ensuring high performance of the schools that already exist. "It’s not that we don’t have plenty of choices," she says. "We have tons of choices! But most of them are mediocre to lousy, so let’s stop replicating mediocrity." Arellano isn't indicting the Detroit Achievement Academy here, because it is, in fact, totally new. She also says, however, that she would not send her own daughter to a school without a track record. Presumably there are many others that feel this way about taking a risk with the Detroit Achievement Academy. That means class sizes are small and budget pressure is high. Krista McClure works in the office at the school, a job she accepted only after she decided to send her son Carnieche to school there. McClure says last year he was in a private Montessori kindergarten and she really wasn't considering public school until she came across the Detroit Achievment Academy by choice. She said she has a small branch on the wall outside her door, to remind everyone that they are all "out on a limb" together. Visit our website dedicated to the first-hand accounts and news reports from this highly divisive, but critical moment in Detroit Public School history. 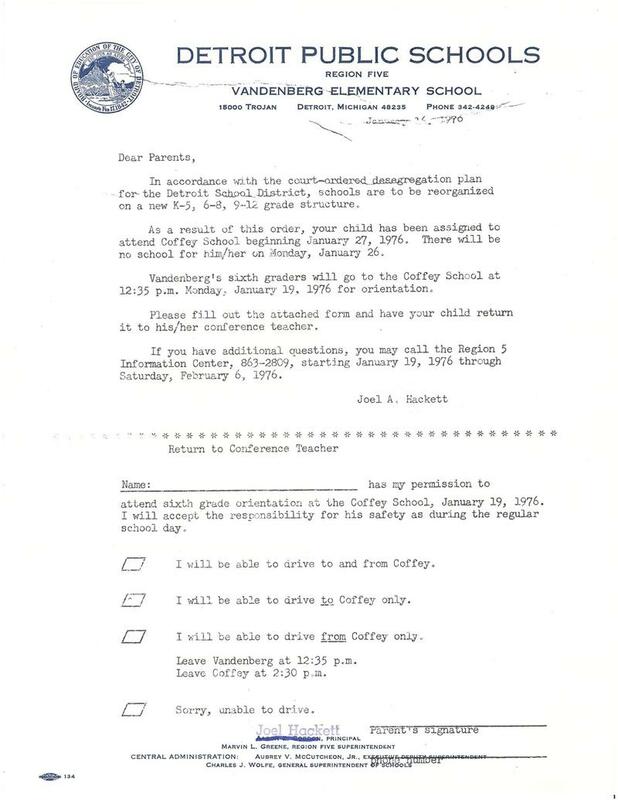 When the order to send kids to schools outside their neighborhood came down, one of our colleagues here at Michigan Radio recalled that it was almost like receiving a draft letter. And while these kids were too young to actually be drafted into the Vietnam War, they were, in a sense, foot soldiers in a conflict that they had no control over. Does racial diversity equal better schools? In 1973, when the NAACP challenged school segregation in Detroit, schools were more diverse than they are today. Back then, about a third of Detroit school children were white. Now, only 4% of kids in the city are white. Next week marks the 40th anniversary of the day the U.S. Supreme Court agreed to hear a case about busing and segregation in Detroit’s schools. The case eventually became Milliken v. Bradley, a seminal civil rights case that nevertheless few people outside legal circles remember. In Detroit, how much school choice is too much? Things are settling down at the Anderson’s house in Northwest Detroit. The two high-schoolers are doing homework and talking to their parents. Like at least 10% of Detroit's kids, they go to charter school outside Detroit. Their mother, Dorothy Anderson said she made her school choices in part because of the bad experience her son had at his neighborhood school. "He was waiting for the bus to go home," Anderson recounts." And he was jumped by a gang of boys. When he tried to get back into the school the security guard wouldn't let him back in. And the school never made a report. It was a huge mess." Anderson pulled her son out of the Detroit Public Schools the next day and never considered sending her younger children to DPS schools. Like many parents, Anderson opted out of the neighborhood school over things like quality and safety. But she said choosing another school was a big job, especially when it came time for high school. "It was a huge challenge. A lot of legwork," she said. "Honestly, looking for a high school for them was as much time as we're spending looking for colleges." Anderson says she might consider Detroit if she had to go through the process again. But, she would need a way to know which schools were really good.